After an amazing Christmas, as written about in my previous blogpost, New Years followed suit. I will be honest. At first, I wasn’t interested in spending New Years with my dad, and his 50+ aged friends, in a small town, somewhere in northwest Poland. I wanted to be in Krakow with friends, find a club worth the party, and have a memorable night. But I take it all back. I had a superb time. I met my parents’ friends. Friends they’ve had since their own university days, since they were in their early twenties! I had heard about these people my entire life, how Betina lived in Germany with my mom for a time, how they wanted to move to Canada (unfortunately, not all papers went through at that time, and my parents’ friends had to return to Poland), all of their travels together, living in dorms together, their group’s mountain-venturing adventures, drunken moments, campfire singing, I have heard it all. Spending a week with these people put me back in time. I could picture all of them, exactly how they were thirty years ago. I could see my dad, just the way he was, and still is. Some people never change. We spent plenty of nights drinking vodka, and singing songs from their song books like “Sokoły”. My dad and Zbyszek had guitars and songbooks, that they browsed through and they sung every song they recognized. It was really beautiful to watch them meld back into youth singing songs that still rung true to them, that reminded them of their lives back in communist times. Sometimes, they couldn’t remember the words to a song. But as a right chord was strung, as someone remembered the first few words, suddenly someone remembered the rest of the verse, and so on. They could manage to sing a whole song that no one even remembered a word of at the beginning! It was full of trial and error, of singing the wrong key, of missing a verse here and there, a wrong word, or a slip of tongue or strumming pattern. It was this unravelling, decrypting, and remembering of songs they hadn’t sung in thirty years. I was blown away by how much came back to them. On a whole, I really enjoyed listening, singing, and the storytelling that came with each song, and just being with them, even as an observer. Watching them over the week, my dad and his closest friends, despite the time and distance spent apart, really reminded me of where I want to be in my life. I want to have friends like his, I want to be like them. So relaxed, so cheerful, understanding, loving, and constantly happy. They were like a family. And that’s how it should be. That’s where I want to be when I am fifty-three years old; surrounded by my oldest, closest friends, always finding something to laugh about, not worrying about anything. This effortless relationship, unchanged. Another thing that made the last part of my winter break great was the sightseeing. Before then, I hadn’t really seen much of Poland, especially not up North. Driving to the sea, to the town of Kołobrzeg, was really great. It was a rainy day and, maybe more-so because of this, reminded me of Prince Rupert and felt a little like home. (Home being Terrace, this time.) I only drive up to Prince Rupert a few times a year, but having Rupert there is some kind of comfort, I guess. I like being near the ocean. Next, we drove to Kamien Podmorski and Szczecin. We drove to Kamien Podmorski because it was where my parents wanted to move to before they decided to move to Canada. Honestly speaking, there isn’t much in Kamien Podmorski. It was sort of like a trip for Dorothy and I to walk in my parents’ footsteps. Likewise was Szczecin, though there is definitely lots there. Szczecin is where my parents and their friends all went to school, met up, basically lived a big chunk of their lives. Unfortunately, because of hangovers and lack of sleep, we arrived in Szczecin late in the day and after visiting with a couple more of my dad’s friends, there was only an hour left of sightseeing, and half of that spent inside in my dad’s old school, looking at old photographs, walking down old hallways. The other half hour was spent driving out of the city, stopping at a couple places to see exactly what houses my parents lived in while there was still daylight, and onwards to our friend’s place where we would be spending the night. 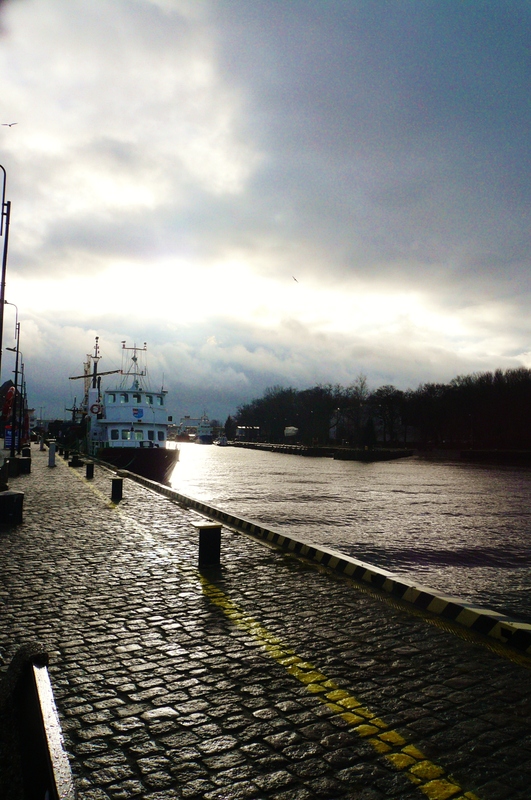 Despite the lack of city-sightseeing, there was something I really, really liked about Szczecin. But I can’t pinpoint what it was. Small things, the way the city was laid out, how it wasn’t completely flat like Krakow, the architecture of all the buildings we passed, but something else, I’m not sure, I felt very drawn to it, perhaps because it was the city my parents called home for quite a few years. I was sad we didn’t have more time, but I think Dorothy felt similarly and I am almost positive we will go back to properly sightsee the beautiful city and to visit our new ‘family’, so to speak. 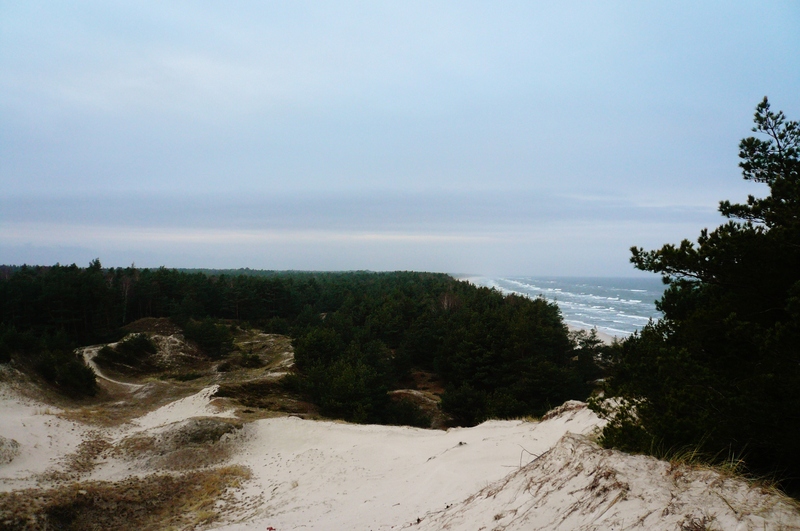 Lastly, we went to the Słowiński National Park. 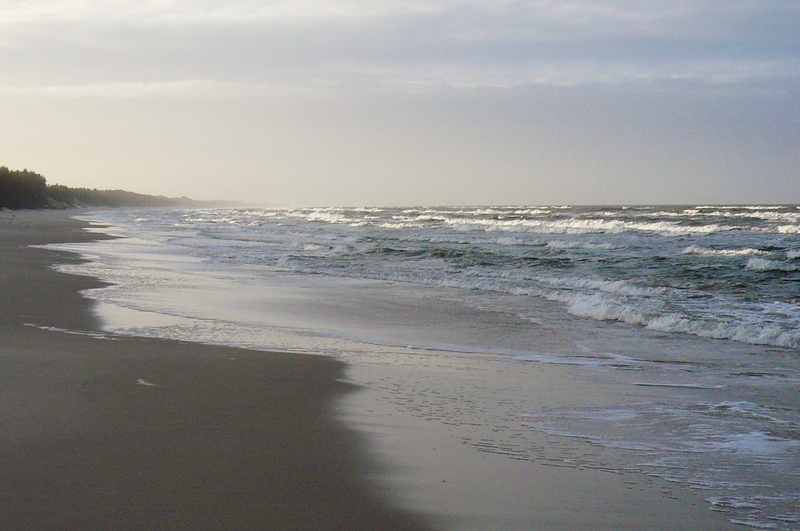 To be found there is, yet again, the Baltic Sea! 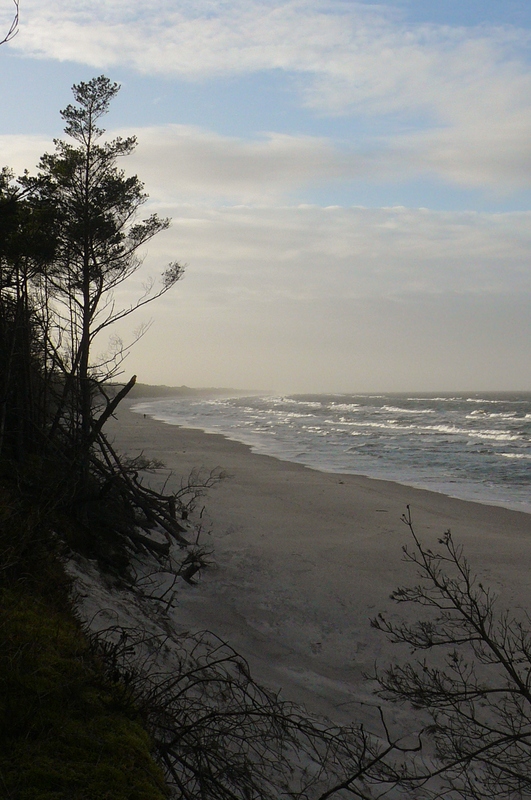 Embroidered by the long-stretching grey-white beaches, towering sand dunes, and pine forest, it is a well preserved area and I really freaking loved it. Who knew how much I was missing nature. Frolicking through the forest, jumping over streams, crossing wild boar tracks a time too many, spotting deer, climbing giant hills of sand, walking on the edges of the shoreline where the water just reaches your feet—yeah, it really made my day. I could’ve spent hours more there, but the time always comes to leave as the sun sets. So my winter vacation had an excellent finish. I met amazing people, new family, I went to the sea, I walked in my parent’s footprints, I saw a new city, and I got to spend almost a month with my dad. Life felt good. I will leave you now with one last picture! 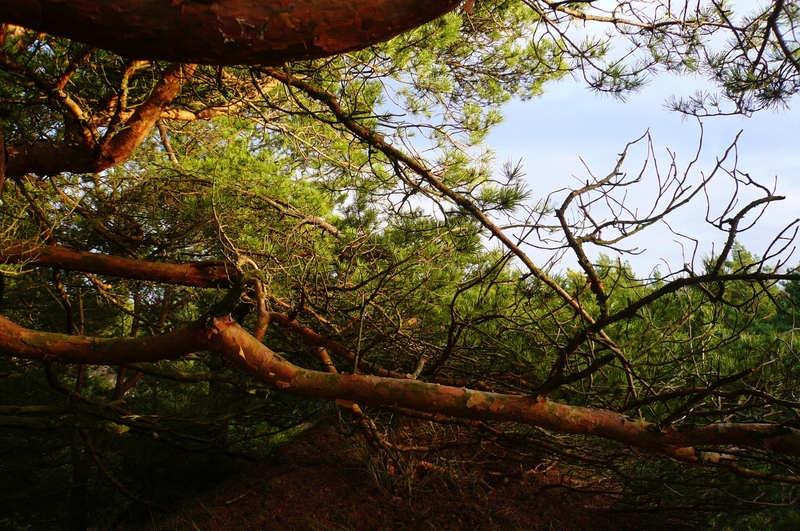 As it is getting dark, on a highpoint, in view of the forest and ocean, leaving. Prince Rupert is a port town right on the ocean, similar in size to Terrace and one and a half hours away from Terrace. Though I definitely don’t feel that way about Surrey (the place I was born) or Vancouver, where my parents also lived a few years. Yes, it was an actual forest, a pine one at that!